The drawings in this unit show side views of an old wooden stepladder. It was found that whenever a workman climbed the ladder it slipped on the floor and collapsed flat. What was actually happening was that the workman climbing the steps created a load acting downwards which passed through the rest of the ladder and into the floor. The floor responded with an equal and opposite resisting force upwards. Suggest three ways in which the stepladder shown in the last unit be improved to prevent it from collapsing flat when in use. There was no resisting force to prevent the legs of the ladder from slipping out sideways. Rubber feet attached to the ladder legs will help the legs to stay in place. More friction will be created between the rubber and the ground as opposed to the wood and the ground. 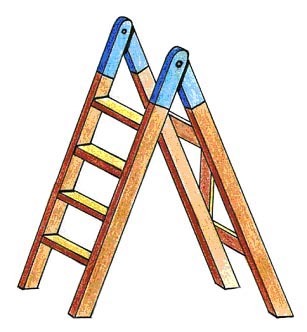 There was no connection between the legs of the ladder to prevent them from moving apart and eventually collapsing flat. 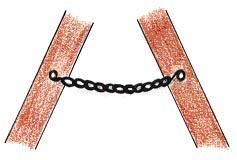 The steel chain, connected to each leg will prevent the legs from separating too far. There was no stop on the hinge at the top of the ladder to prevent it opening wide. 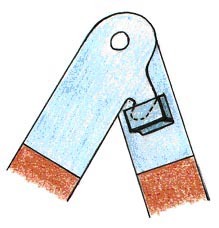 The stop locks the hinge into place.